Epsom salts are known for their therapeutic effects, so why not start enjoying a true spa experience in the comfort of your own home? This type of salt is used for foot baths as it can soothe tired and sore feet. The skin will absorb the magnesium sulfate contained in the salts, helping reduce inflammations, relieve tension, and provide a smooth skin in return. 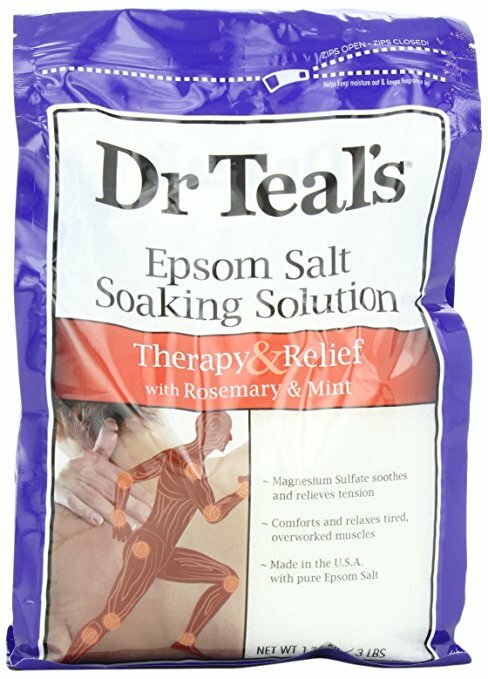 Dr’ Teal’s Epsom Salt is enriched with soothing mint and rosemary which will create the perfect relaxing and spa-like atmosphere in your bathroom. The salts are not only beneficial for your feet but for your entire body. The product will help you reduce stress and relieve tension, getting you rid of muscle pains. If you are a professional athlete or a person who prefers a very active lifestyle, these bath salts are perfect for you. They will relax your overworked muscles and allow you to fully recover from a long day standing or running. 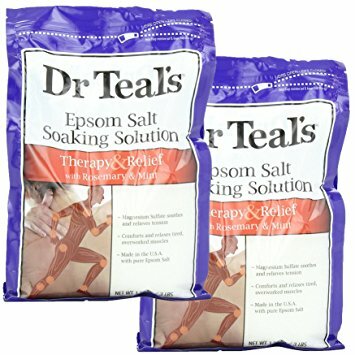 This package includes one Dr. Teal’s Epsom Salt soaking solution of 48 ounces, which is more than enough to enjoy about 50 relaxing baths or showers. According to the directions, you’ll have to use about two cupfuls for each bath to enjoy its therapeutic effects. This product is perfect for all types of skins, but it could really prove beneficial for those with oily to combination skin. The soaking solution is enriched with mint oil that not only calms your senses and cools your skin but will also balance the sebum production in your body, helping you achieve a glowing-looking skin. It is perfect for mild body imperfections caused by excessive sebum such as blackheads, small pimples or acne. The mint oil has antibacterial and antiseptic effects that will protect your skin’s natural barrier and improve the aspect of your skin. If you are a person who enjoys intense physical training, you will be pleased to find out that this bath salt will soothe sprains, stings, and aches. It will comfort and relax all the overworked muscles in your body for you to get a full recovery as soon as possible. The benefits of this bathroom salt don’t stop at relieving your muscles from sores and aches. Thanks to the soothing and calming effects of rosemary and mint, your mind and spirit will finally be able to relax as well. The product will release anxiety, stress, and negative thoughts, helping you reach a peaceful state of mind. 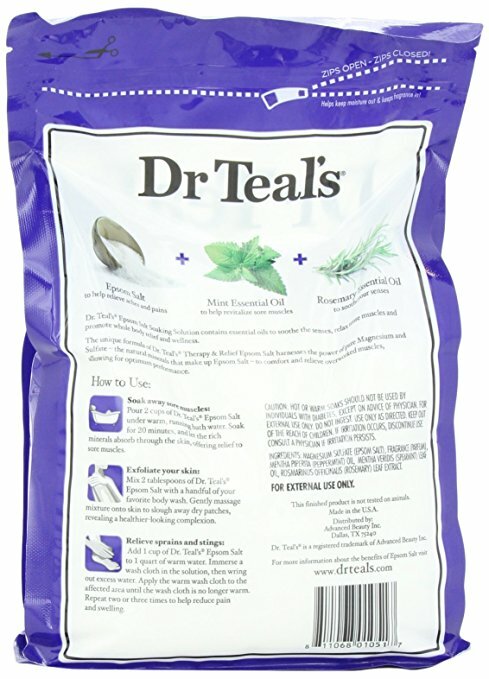 Most of the customers who purchased Dr. Teal’s soaking solution praised its quality and therapeutic effects. The product provides a genuine and full spa experience in the comfort of your own home. Just two scoops of this salt are enough to create a calming atmosphere.